Nowadays many tourists in Bath are attracted by the town’s literary connections, while the unspoilt Georgian streets make the town a popular location for film and TV dramas. One of Bath’s earliest literary mentions is in Chaucer’s Canterbury Tales, where the Wife of Bath is one of the most colourful characters on his pilgrimage. 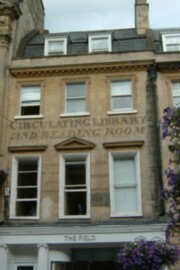 However, most literary references to the city relate to Bath’s Georgian heyday. Jane Austen wasn’t too keen on living in Bath, but she nevertheless set a couple of her novels, Persuasion and Northanger Abbey, in the fashionable spa town. She lived here -reluctantly – for several years, and came to scorn the frivolities and shallowness of Bath’s high society. If her depiction wasn’t altogether flattering, that hasn’t stopped the city from making the most of its Austen connections. The Jane Austen Centre offers introductory talks and a small exhibition related to Austen and her time in Bath (entrance charge). They also run a Jane Austen festival, and have a good shop, where you can buy a wide range of gifts for enthusiasts of Austen or of the Regency period in general. Readers of more recent Regency romances will also find much to interest them in Bath. From the stylish crinolines in the Fashion Museum to the streets walked by strong-willed heroines and their dashing suitors, it’s easy to find yourself plunged between the pages of your favourite novels. Georgette Heyer, undisputed queen of the genre, set several of her witty and well-researched romances in Bath, including the classics Bath Tangle, Black Sheep and The Foundling. Thanks to the Georgian developers, Bath has unusually coherent architecture, with whole streets dating to just one period. Consequently it makes a great backdrop to costume dramas, and often stands in for other cities whose heritage is less well-preserved. Among the recent films to feature local locations was the 2004 film version of Vanity Fair. Parts of the city were closed down for filming, with many locals employed as extras. The set designers replaced some street lamps on Great Pulteney Street with period reproductions, and left them as a gift to the town. Various television and film productions of Austen’s novels have been shot in Bath, including the BBC’s sensitive 1995 Persuasion, in which many Bath locations can be recognised. The countryside around Bath, rich in picturesque villages and elegant stately homes, has also starred in a number of films. The Remains of the Day was filmed almost entirely in this area: ‘Darlington Hall’ exteriors were shot at Dyrham Park, while its interiors were filmed Corsham Court (Wiltshire) and Badminton House (Gloucestershire). Two local village inns also appear in the film: the George in Norton St Philip and the Hop Pole Inn in Limpley Stoke. Seaside scenes were filmed at Weston-super-Mare. A short drive from Bath is the lovely historic village of Lacock, which belongs to the National Trust. Numerous television programmes and films have been shot here, including the BBC’s wildly successful serialisation of Pride and Prejudice (1995), Jane Austen’s Emma (1996) and Harry Potter and the Philosopher’s Stone (2001).